Apple may have started the Smartphone revolution, but it was Samsung who created the ‘phablet’ category within this tech industry. Its Galaxy Note released back in 2011 exceeded all expectations. There was always a rivalry between these two manufacturers, and it will most likely last for another decade. Apple’s newest iPhone 6 Plus claims to be an ideal gaming device; Samsung claims the exact same this with its latest Galaxy Note 4. Who’s going to win eventually? Here’s a closer look at the main technical features of these two amazing ‘phablets’. 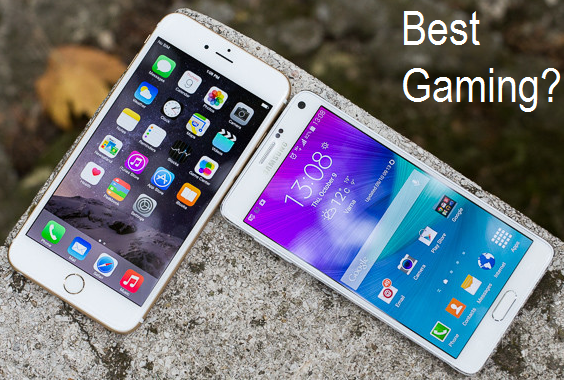 Today, we are writing a detailed Comparison of Samsung Galaxy Note 4 vs. Apple iPhone 6 Plus: Which One is the Best Online Gaming Phablet Device? Apple has finally understood that size matters. Its newest iPhone 6 Plus comes with a 5.5 inch screen, which is perfect for gaming. Unlike previous versions of the iPhone that were a lot smaller, the 6 Plus highlights a much better display. On the downside, it still can’t compete with Galaxy Note 4’s 5.7 inch screen. Certain mobile games require wider screens; a gamer should be able to hold the device with both hands, and thus access commands much faster. As for the quality of the images and videos, the Note 4 pride itself with a 1400 x 2560 Quad HD, which basically means that the Super AMOLED panel highlights 515 pixels per inch. On the other hand, we have the iPhone 6 Plus which displays a 1080 x 1920 resolution (401 pixel density). Should we assume that games are clearer on the Note 4? Maybe, although some experts claim that the differences are barely noticeable. When Apple released the new iPhone 6, it also revealed Metal, a brand new developing kit for game developers. It is meant to improve the graphics on all iOS games. iPhone 6 and 6 Plus are thus taking gaming experiences to a whole new level. Thanks to a bigger screen, the games will also look and move better, faster. There’s no denying that the 6 Plus has great potential, and it could be a killer gaming device. It comes with a great screen and it feels comfortable in “landscape mode”. Also, the lifespan of the batter has been extended, too, in order to allow casual gamers to enjoy their games at full potential. Considering that the Galaxy Note 4 is bigger than the latest iPhone, it could mean that the gaming experience is improved. Casual gamers are able to stream console-quality games directly onto their devices using OnLive. Fans will receive free access to a substantial gallery of games thanks to Samsung’s newest partnership with cloud gaming company OnLive. According to Samsung, anyone who purchases a Note 4 will receive a FREE 3-month subscription to the gaming service. OnLive claims to be revolutionary since it streams the exact same software gamers would enjoy on high-end gaming computers. This means you have 3 months to enjoy the latest, most amazing mobile games. Some of OnLive’s greatest names include ‘Batman: Arkham Asylum’, ‘L.A Noire’ and many others. As much as we love the new iPhone 6 Plus, it doesn’t feature side-by-side multi-tasking. Samsung has been offering this feature for quite some time now; the Multi Window comes in handy when you want to access more pages at the time, or you’d like to try out more apps. Last but not least, all phablets should feature easy sliding. On the iPhone, you get to slide the screen by double tapping on the home button; as for the Note 4, you can shrink the whole screen with a single tap. This can come in handy when you’re accessing more apps and games at the same time.